Canadian Museum for Human Rights: Too many controversies for a museum? 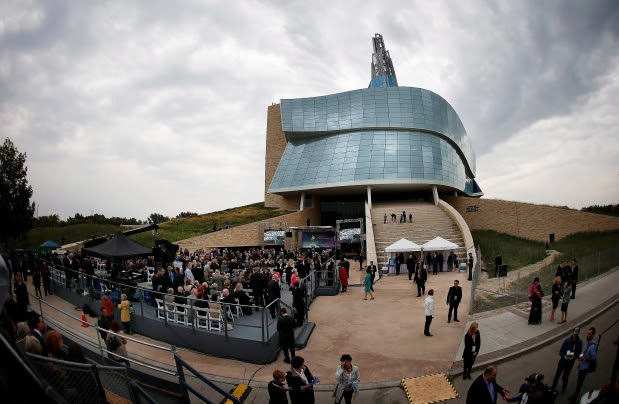 Canadians had their first glance at the Canadian Museum for Human Rights on Sept. 19. Ironically, a museum that has been plagued by controversy has ignored the most important controversy of all: What do human rights mean to Canadians? …There have been many controversies surrounding the museum. Ukrainians have demanded greater recognition of the Holodomor. First Nations insist that the museum frame their experience as genocide. Each of these issues is addressed in the new museum. And yet there is not a single attempt to help Canadians understand their own rights culture. Human rights is an historically new concept. Before the 1970s, Canadians were more likely to frame abuses as violations of Christian values or British justice. Now, it seems everything is a human right. Are your taxes too high? That’s a rights violation. Is your school board providing poor services? Complain to the human rights commission! The photo of the museum, which accompanies the article, does not make it look very attractive to me. But I never did ‘get’ modern architecture. I have no answer to the ‘human rights’ questions either. Just that they always seem to benefit immigrants or criminals.